When I think of the word “bard,” I think of Shakespeare. However, when it comes to libraries, BARD stands for Braille and Audio Reading Download. It is an internet-based service from the National Library Service for the blind and physically handicapped (NLS) that enables the user to download materials to their personal devices. BARD has thousands of books and magazines available for download to your iOS or Android device with no waiting. 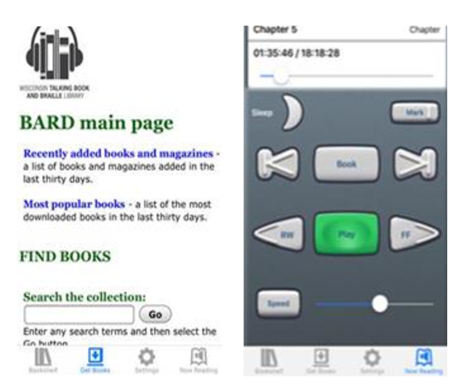 Patrons can sign up for BARD at https://nlsbard.loc.gov/login//NLS or call the Wisconsin Talking Book and Braille Library (WTBBL) at 1-800-242-8822 to get started. In order to use BARD, a patron must have an email address and be in good standing with WTBBL. For more information about the Wisconsin Talking Book and Braille Library, or to see their latest newsletter, please visit their website: https://dpi.wi.gov/talkingbooks.